King Kong is one of the greatest fictional tales of all time. It was originally created as a hit movie back in 1933 and tells the story of a gigantic gorilla-like monster that is captured on a mysterious island in the South Pacific and brought back to New York for an exhibition where he breaks loose and reaches a tragic end atop the iconic Empire State Building. King Kong – Island of Skull Mountain is based on the eponymous monster's first movie outing and the band of foolish human beings that try to take him from the wild and put him into captivity. 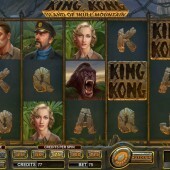 The slot is a 5 reel, 243 ways to win game from Amaya Gaming. 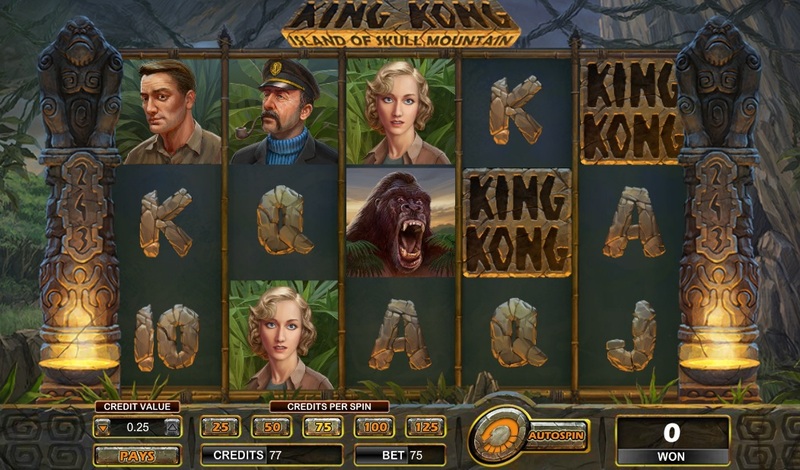 There is a wealth of symbols on the reels including characters from the original 1933 movie such as King Kong himself, Ann Darrow, Jack Driscoll, Captain Englehorn, and the regular 10-through-to-Ace symbols that have been carved out of stone. The Wild symbol appears in the shape of a King Kong logo carved into stone. It can substitute for all other symbols, except for the Gate symbol, to complete any possible winning combinations that are created on the reels on each spin. It does only appear on reels 2, 3, 4, and 5. What Will Come Through the Gate? This Gate symbol plays a pivotal role on this slot. Now, the downside is that there are no free spins to be won but the action does come in the form of this Gate symbol. Basically, if you hit a Gate symbol anywhere on the reels on a spin then it will open to reveal a symbol, except for a Wild. In that respect, it essentially acts as a second Wild helping to create more potential winning pay outs. The fact this can happen on any spin really adds some thrills to the spins. Unfortunately, that is the only action on the reels that there is. The game is quite limited. The pay outs are far from the worst you will come across. You only need to spend a few minutes playing on the medieval sequel slot Avalon II to know what I mean. However, in this slot we have a great theme, some fantastic atmosphere created on the reels by the backdrop, and a superb feature with the Gate symbol. Sadly, it does not go a little bit further with free spins or another bonus feature. You're probably better off playing Playtech's version called Kong.